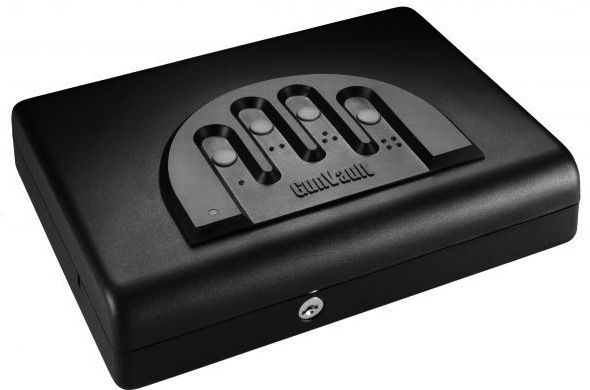 This is a review of the MicroVault MV 500 by GunVault, a mid-tier offering in their portable safe line. The MicroVault line contains the following models, the MV 500 (2.25 x 8.5 x 11), the MV 1000 (3.5 x 10.25 x 12), and a biometric version of each model. I purchased the non-biometric model for my car safe. It was important that the vault slide underneath the seat and at least hold my full-size Glock (w/extended barrel), so I decided on the 500 model instead of the 1000. I’ve owned my unit for three months at the time of this review and the use case is as a car safe with additional intent to store firearms in a hotel if we ever travel to a state that does not have reciprocity with Texas (or I do not have a nonresident CHL for that state). The MV500 interior dimensions are 2 x 6.5 x 10.75. 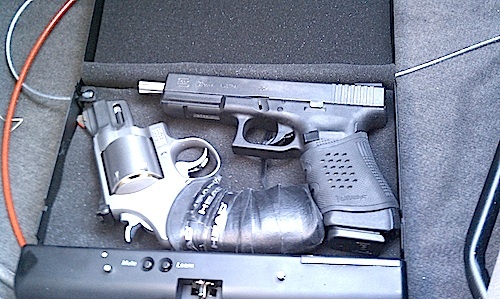 As shown below, the unit with the factory foam liner holds my Glock 31 with extended barrel and a Smith 629 (short-barrel). That’s an N-frame revolver. The fit is a bit tight, but I did not have to force anything. Unlike the lower-end models (the NanoVault line), the micro- and mini-vaults are reputed to be nearly impervious to common hand tools. They all come with a security cable. The micro-vault line is electronic and the internal computer prevents access after multiple invalid attempts to enter the code. A flashing red light warns of invalid entry attempts. The models also have a patented hand mold on top that facilitates proper finger placement on the keypad without directly looking at the unit. The MicroVault also has a weak battery indicator to inform you well in advance on when to replace the 9-volt battery that powers the unit (and there is a backup key). After entering the proper code, the top moves upward, but is not spring-loaded; it must be completely opened by hand. I actually prefer this for car usage, although some may have to get used to the operation. The units are advertised as waterproof, but I have yet to immerse one in water to find out 🙂 They are also claimed as approved for TSA travel, but I don’t fly very much and have yet to test this claim in action. I also have not attempted to compromise the security cable. It seems reasonable enough to deter a smash-and-grab car thief or hotel cleaning staff, but I would probably not put it up against a determined professional. MSRP is $159, but you can get them at local gun shows in the $100 to $110 range. So far, I’ve been pleased with mine. I use it at least once a week to store firearms while I’m at gun shows. In three months of 1-3 times a week usage, I have not experienced a single problem.